The first time you meet Ashif you see a lanky tall Kenyan man, with dreadlocks poping out every which way, wearing an all green jump suit with the words “Brains on high voltage” tagged across the back. Everything about Ashif suggests a laid back and passion lived life that keeps him happy perhaps despite his circumstances. 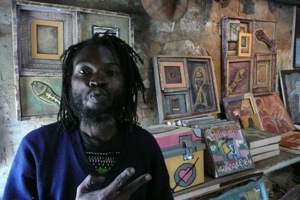 Living in Kibera district of Nairobi Ashif is quick to tell you that his relation to art and ability to express himself through a medium is one of the main reasons he is able to find contentment, no, pride in his district of Kibera. Ashif, Gomba, Rabala and a few others others began the Maasa Mbili art studio a few years back after renting out an abandoned pub. As their work began to grow and become recognized they also expanded the programs they run, specifically, a children’s weekend art program. One all they artists quickly say is that it only until later in life did they begin to use art as a medium for expression. School programs from grade school to high school don’t include art programs as part of their curriculum, so Maasa Mbili decided to start free weekend art classes for local kids. While the project alone is amazing, what’s quite interesting is that much of the art is street art including chalk, regular paint, and spray paint. The artists use messages of peace and freedom as a means to spread messages across the community and influence the daily actions of those who interact with and come across these messages on a daily basis. The studio has gone through its transitions including down sizing and a changing in membership. Including the infamous artists Solo 7 who made international headlines during the 2007 post-election violence for spreading his message of “peace wanted alive” in spite of adversary from his own people. Solo 7, the seventh child, born on July 7, of 1977, again made the international spotlight in Kenya’s most recent election, including an interview with CNN and the NY times. The studio has grown and now attracts international attention from graffiti artists in Denmark, Norway, the US, and Amsterdam. 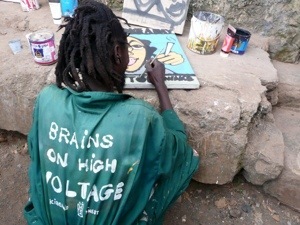 Kibera also has the infamous parody of banksy, bankslave, whose slogans and pieces can be found all over Kenya. While they are incredibly small scale, the studio showcases the power of street art and the influence of art as a form of expression, in Kenya and globally.